The Apollo Project is considered to be a conspiracy theory among many different individuals in the United States and other locations throughout the world. On the 20th of July in the year of 1969, millions of people in the United States and other locations around the globe watched their televisions as the astronaut from the United States named Neil Armstrong stepped out of his spacecraft and onto the moon. This marked the very first time that any human being walked on the moon. Armstrong was heard in homes everywhere stating: "One small step for man, one giant leap for mankind", but according to conspiracy theorists, this was far from being the first official moonwalk. · If you look at the film and the photographs taken of the first moonwalk, you will notice that the "sky" is quite dark and that there is no presence of stars or other planets. · If you notice the sand on the moon, it shows the footprints of the astronaut quite well. However, if you look at where the spacecraft landed, there are no traces of dust on the legs or body of the craft nor is there any type of crater displaying the fact that it landed. · In the Apollo Mission, NASA established that the moon was considered to be a sterile environment. However, on missions after the establishment was made, astronauts were forced to spend large amounts of time in quarantine. 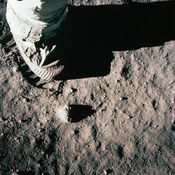 · When Armstrong was coming out of the spacecraft to walk on the moon, a footprint was visible on the ground beneath him. This could not have been possible if he was truly the first man to walk the moon - unless it was staged and they did a few practice runs. · Then, ironically, nearly all of the astronauts that were part of the Apollo Program ended up becoming high level executives in an assortment of high paying corporations. Could this have been based on education and expertise or part of the program to encourage them to remain silent about the conspiracy behind the Apollo Project? Was the Apollo Project a conspiracy to swindle the Americans of their hard earned tax dollars? While this has not been confirmed, it is considered to be one of the world’s greatest unsolved mysteries.